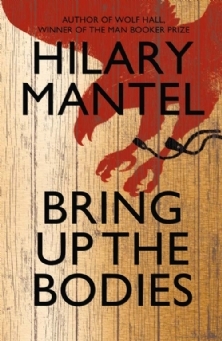 Bring Up The Bodies is the sequel to Wolf Hall, Hilary Mantel's acclaimed Booker winner about Henry VIII's advisor, Thomas Cromwell. I loved Wolf Hall, to the point where I have to sit on my hands when talking about it in order to stop myself from grabbing people by the shoulders and shaking them in excitement. So could Bring Up The Bodies ever, in my eyes, live up to its predecessor? As it turned out, yes. In fact, I'd go so far as to say it surpasses it. Bring Up The Bodies has a tighter structure and a little more pace than Wolf Hall, and Thomas Cromwell - as he carefully, cleverly, calmly works to engineer the downfall of Anne Boleyn and fulfil the whims of the capricious king, while neatly taking revenge on those who wronged his beloved Cardinal Wolsey - becomes a more intriguing and ambiguous character with every turn of the page. His motives are complex, his relationships fascinating. He can be a genial father figure and a compassionate statesman one moment and coldly vengeful, chillingly pragmatic and almost sociopathic, the next - and yet Cromwell never seems inconsistent or implausible. Adept when it comes to acquiring money, power and influence, Cromwell is also all too aware that his position at the right-hand of King Henry is a precarious one. Many fear him, and rightly so - but as readers, we're privy to his vulnerability, and Bring Up The Bodies is packed with dark foreshadowing to hint at what could be to come in the third planned instalment in Mantel's Cromwell trilogy. "I have everything, you would think," Cromwell tells his nephew. "And yet take Henry away, and I have nothing." Other characters, too, are sketched with exquisite verve. Cromwell's sweet-natured son Gregory, his ward Rafe Sadler, servant Christophe and the imperial ambassador Chapuys are particularly engaging, and the Seymours, bent on making their daughter Jane the King's mistress, are darkly comic as they and Cromwell to make use of a daughter who has previously been 'as much use as a blancmange' but could become a commodity if she is prepared to 'earn her keep'. The wider roles of women in the Tudor court, and the rigid class structure that applies even to torture methods, are also fascinatingly explored throughout. I read this book on my Kindle, which provides a neat little facility for highlighting and noting passages of novels that particularly appeal. Generally, I'll highlight a couple of lines or paragraphs in a book, but when I read Bring Up The Bodies, I had to stop myself from highlighting everything that stood out for me because there was simply too much. There are examples of beautiful prose, of descriptions that balance poetry with precision, of sharp wit and pitch-perfect dialogue on every page; at every turn, I could find something new to praise. I know that there are readers who detest Mantel's style, and I can fully understand why it is not to everyone's taste, but for me, her books are are a writer's masterclass in making perfection seem effortless. It's only July and yet I'm confident in naming Bring Up The Bodies as my book of the year. Can the final book in Mantel's Cromwell trilogy be as good as this, I wonder? It seems too much to ask, but my hopes are high. Definitely well-deserved. I loved Bring Up the Bodies every bit as much as I did Wolf Hall, and both are on my list of all-time favourites. I have a total fascination with Thomas Cromwell thanks to the books. Mantel challenges the reader with a variety of foreign words and unusual English words, and I loved every minute of it though my copy of the book (ARC) has many dog-eared pages where I had words to look up.